Out from the wilderness and quietly released with little fanfare, the Youth Wellbeing Index (YWI), by the International Youth Foundation and Hilton, is back for its second edition. Once again measuring the multidimensional aspects of youth wellbeing, the 2017 version of the YWI adds a domain, kicks out and switches some old indicators, and utilises opinion data from the new Global Millennial Viewpoints Survey. In this article, we look at the big methodological changes and their implications for measuring youth wellbeing and youth data globally. 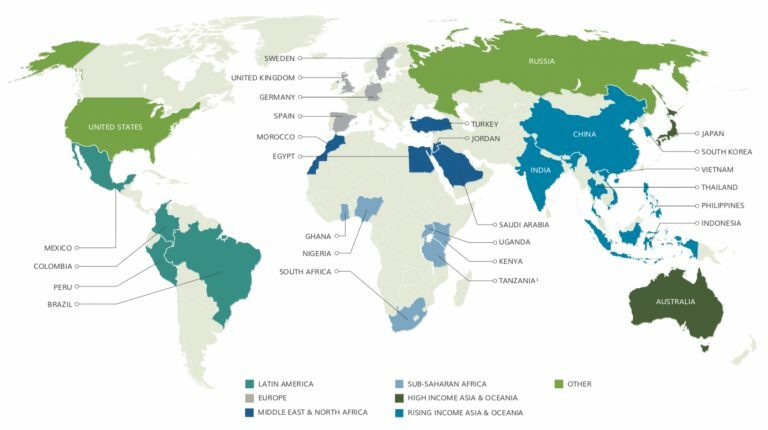 The key features remain the same between the 2014 and 2017 versions: The YWI measures wellbeing in a selected 30 countries around the world, which it calculates to be 68 percent of the youth population. The 2017 edition uses the same domains as the 2014 (with the new addition of Gender Equality – discussed more below): Economic opportunity, Education, Health, Safety & Security, Citizen Participation, and Information & Communication Technology. Youth perception indicators, measuring youths’ subjective outlook on a topic. In fact, it is the inclusion of youth perception indicators, as well as the three additional domains of (1) gender equality (new in 2017), (2) safety and security, and (3) ICT, all focused on only 30 countries, that sets the YWI apart from the other global youth index, the Youth Development Index by The Commonwealth (read more from our coverage of the YDI here, and here). As described under the small section “Why another index?”, the YWI describes itself as complementing (not competing with) with YDI. Interestingly, both the YWI and the YDI data computations were outsourced to the same organisation, the Institute for Economics and Peace in Australia. While the main structure and intent of the YWI has broadly stayed the same, some significant changes were made, mainly with the addition of a new domain, changes in the indicator selection, and a new source for youth perception data. The most significant change to the index is the addition of a new domain: Gender equality. This is in line with Sustainable Development Goal (SDG) 5 (gender equality), and the whole YWI report has a larger emphasis on framing its results within the SDG agenda. 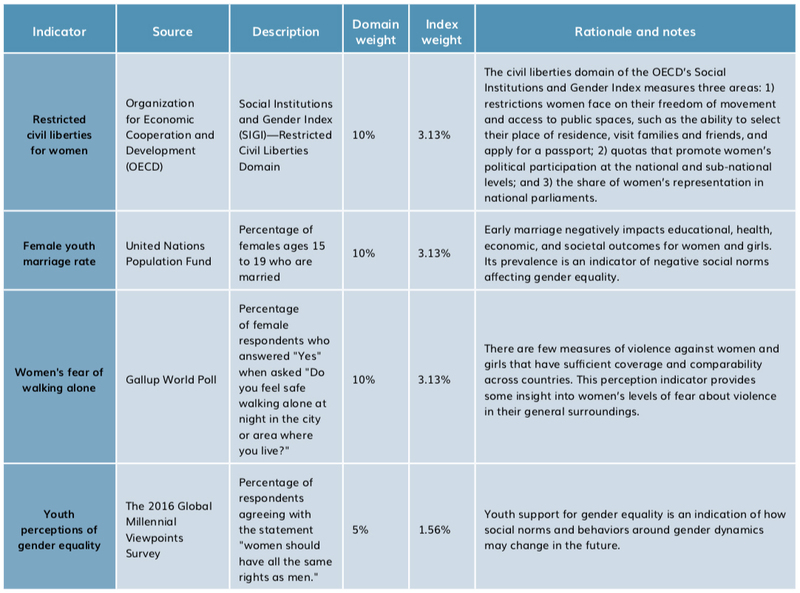 The new domain looks at four indicators, to capture the basic rights and freedoms for women broadly, including their chances for leadership roles; the rates of early marriage, which places girls at significant risk to damaging future life prospects; dimensions of gender-based violence, which to date lacks consistent and reliable data and is therefore approximated through the use of a perception indicator on the fear of walking alone; and a perception indicator on whether or not young men and women support gender equality. The methodology states that in a majority of cases, indicators were removed because updated data was unavailable, or because more appropriate indicators have now become available since the release of the first index. When looking closely at the changes, we can also see that there is a shifting conception on what makes up youth wellbeing itself. In education, for example, tertiary school enrollment has been replaced by lower secondary completion, taking into account that for many youth around the world, tertiary school is either unattainable or does not have as great of a bearing on their life chances as the completion of lower secondary school. In the ICT domain, which underwent the most changes in indicators of all domains, the “Households with radio”, “Access to electricity” and “Digital natives” indicators were removed, and the indicators “Youth internet access at home”, “Internet usage” and “Mobile phone subscriptions” were added instead, showing a greater focus on the role of internet, and especially mobile technologies, on youth wellbeing. 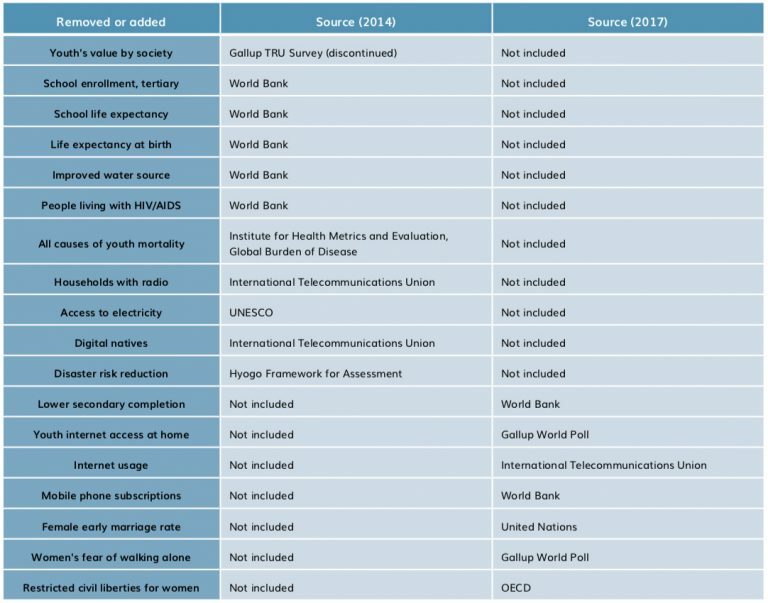 Methodologically, it makes sense that the digital natives indicator was removed (defined as the % of digital natives between ages 15-24), simply because it had only been computed once as part of the ITU’s Measuring the Information Society Report in 2013. Conceptually, it makes sense as well, given that it’s a generalising generational classification that measures those youth who grew up with theoretical access to the internet and digital technologies, rather than the actual level of internet access or digital penetration. With the replacement of the ICT perception indicator “I can’t imagine my life without the internet anymore”, previously measured by the (now discontinued) Gallup TRU Survey, by the indicator “Youth internet access at home” – which is less of a perception indicator, but rather the percentage of respondents 15-29 years whose homes have access to the internet – ICT is the only domain in the 2017 YWI edition without a perception indicator. Given the current policy and media discourses, it would be interesting to include a new subjective ICT indicator in the next YWI edition, such as perceptions of online safety, internet addiction, or feelings on if the internet has improved key aspects of young people’s lives (such as education, the ability to find a job, or connect with friends). While direct comparison should be taken with a grain of salt given the changes in methodology, youth wellbeing is shown to be improving slowly. While not showing the calculations, the 2017 YWI states that using the same set of indicators as the 2014 index and updating data where available, youth wellbeing in index countries improved by 2 percent. The YWI is cautiously optimistic: “An improvement of 2 percent is a positive sign, but the rate of change is not quick enough to meaningfully impact this current, largest generation of young people”. The slow rate of change can be seen when looking at the top 8 and bottom 8 countries from 2014 to 2017, which have held fairly constant with only a few changes. The same top 8 countries have high levels of wellbeing, with a few changes: Australia moves down a rank and Sweden takes the 1st position, South Korea dropping the most from 3rd to 8th, and Spain improving from 8th position to 6th. As many inputs for youth wellbeing are resource-intensive (ex. education, health care, technology), it is reasonable to expect a strong correlation between GDP per capita and levels of youth wellbeing. The bottom 8 countries are roughly the same, with a few notable exceptions. Egypt falls from 24th to 29th, but Thailand drops 15 places, from ranking 10th in 2014 to 25th in 2017, and similarly for Vietnam, which drops from 11th in 2014 to 26th in 2017. The global youth indices are in evolution, very much so in response to the scarcity of reliable, robust, frequently and consistently updated data sources. Similar to the Youth Development Index (which also changed its methodology in its 2nd edition), comparisons between the 2014 and 2017 versions of the Youth Wellbeing Index are therefore only possible to a very limited extent. With the underlying changes in indicator and data sources – as necessary as they may be – the usefulness of both indices as policy instruments seriously suffers. Without diving into the datasets, desecting all changes, and recomputing rankings with old and new indicator sets, it is impossible to plausibly explain changes in the rankings, whether as drastic as Vietnam dropping from 11th in 2014 to 26th in 2017, or as nuanced as Australia and Sweden switching 1st and 2nd rank. While the Youth Development Index has undertaken the effort of recomputing all rankings all the way back to 2010 with its revised methodology, the Youth Wellbeing Index has simply removed the 2014 report and data, which seems an unnecessary step to undermining the solidity of one of the very few policy instruments we currently have in the global youth sector. It is, however, even more disconcerting that governments, such as Tanzania, are mandating that all data be approved by its national statistics agency – despite much of the data being sourced from international bodies. Such a move is a brazen attempt to suppress any independent analysis of young people and their lives, to the detriment of the country and young people themselves. Without a robust evidence-base to measure youth development, both locally and internationally, there is little hope that the realities of young people can be improved by informed policies and programmes. Written by Cristina Bacalso and edited by Andreas Karsten. All images adapted from: International Youth Foundation & Hilton (2017). 2017 Global Youth Wellbeing Index. International Youth Foundation: Baltimore.